It’s fair to say that, during World War I, Herbert Kitchener’s face was just about the most famous in the country. 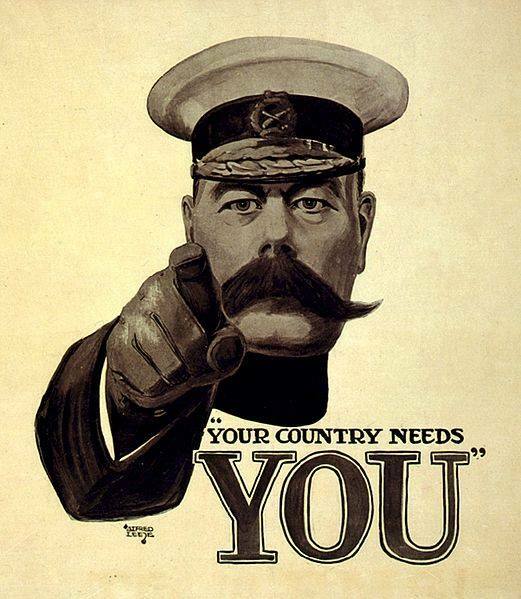 His commanding image, appearing on recruiting posters demanding “Your country needs you!”, remains recognised and parodied in popular culture to this day. Before the First World War, Kitchener won fame for the imperial campaigns, most particularly in the Sudan and South Africa, which made him a national hero. This made his unexpected and bizarre death in the middle of the war a demoralising shock. The official story is that Kitchener was killed in 1916 when the warship taking him to negotiations in Russia was sunk by a German mine of the coast of Scotland. But some suspected that this was a cover-up – a convenient explanation put out to appease a puzzled public who were in need of some sort of closure. Locals spoke of mysterious events that took place on the night of Kitchener’s apparent death. A variety of rumours, speculation and conspiracy theories have since then refused to be dismissed entirely. A further investigation was requested by many who remained unconvinced by the official version of events. This was impossible at the time due to the ongoing war effort but, in all the years since, the call for the case to be re-opened has never quite gone away. The question of what actually happened to Lord Kitchener has still to be answered definitively. Lord Kitchener sailed from Scrabster to Scapa Flow on 5 June 1916 aboard HMS Oak before transferring to the armoured cruiser HMS Hampshire for his diplomatic mission to Russia. Later the same day, while en route to the Russian port of Arkhangelsk during a Force 9 gale, Kitchener’s ship was said to have struck a mine laid by the newly launched German U-boat U-75 and sank west of the Orkney Islands. Kitchener, his staff, and 643 of the crew of 655 were drowned or died of exposure. His body was never found. The survivors who caught sight of him in those last moments testified to his outward calm and resolution. Locals in Orkney, however, tell a different and quite disturbing story. They say that, when they were woken that night by the terrible sounds of a wrecked ship and drowning men, they did their utmost to help. However, their efforts were hindered – by whom, it is not entirely clear. What is beyond dispute is that, during his controversial life, Kitchener made no shortage of enemies. Consequently, when news of his death spread, among the heartfelt obituaries and widespread outpourings of genuine grief, there were more than a few who had cause to be happy that Kitchener was gone. Kitchener was a soldier and imperialist to the core – one of the main reasons why the British Empire was feared at its height. But he was never an easy man to get on with. His term as Commander-in-Chief (1902–09) of the Army in India saw him quarrel with the Viceroy Lord Curzon, who eventually resigned. Kitchener’s campaign in Khartoum in particular was marked by a brutal efficiency which earned him the moniker ‘The Machine of the Sudan’. It was said even among his own soldiers that Kitchener was a man without a soul. It was under his command that British forces imprisoned Boer civilians in concentration camps during the Boer War. Shortly before Kitchener’s death during the First World War, he was blamed for the shortage of shells in the spring of 1915 and stripped of his control over munitions and strategy. It is perhaps unsurprising, in light of all this, that after his death there were no shortage of candidates willing to step forward to take responsibility for ending his life. Foremost among these was Frederick Joubert Duquesne, a Boer soldier and spy, who claimed that he had assassinated Kitchener after an earlier attempt to kill him in Cape Town failed. Duquesne’s story was that he posed as the Russian Duke Boris Zakrevsky in 1916 and joined Kitchener in Scotland. While on board HMS Hampshire with Kitchener, Duquesne supposedly signalled a German submarine that then sank the cruiser, and was rescued by the submarine, later being awarded the Iron Cross for his efforts. This far-fetched story is almost universally derided as wish-fulfillment by an attention-seeker. Another popular theory – that the Hampshire did not strike a mine at all, but was sunk by explosives secreted in the vessel by Irish Republicans – has similarly been discredited because there is not a shred of evidence to support it (although it is admittedly equally hard to disprove, for the same reason). The German General Erich Ludendorff stated that Russian communist elements working against the Tsar had betrayed Kitchener’s travel plans to Germany. He stated that Kitchener was killed “because of his ability”, as it was feared he would help the Tsarist Russian Army to recover and for this reason had to be disposed of at all costs. Recently I visited Kitchener’s last gunboat, the Melik, hidden amongst some trees near the shores of the Blue Nile in Khartoum. It’s been the club house of the Blue Nile Sailing Club since its retirement from active service in the 1920s and used to be moored on the river until an unusually high flood in the 1980s left it stranded high on the river banks. The boat must be one of the few physical reminders of Kitchener left in Khartoum. Kitchener Street and The Kitchener Memorial School have been renamed and his statue removed to Kent. I think he must have introduced Freemasonry into Sudan and there used to be a masonry hall. He certainly laid down his mark on this city with even the street layout was planned by him. A determined but odd man!